"I am looking for a funny boat name." Okay, that's it... nothing else to see here. 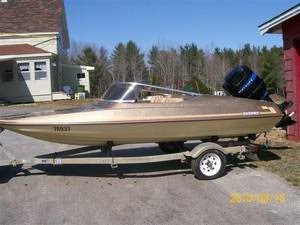 If you have any good, funny boat name ideas from looking at this guy's picture of his gold boat, please post them below. I own the boat, Sorry I didn't realize i didn't to put more. Heres a little history on the boat, it's been in my family for 26 years, owned by my two uncle and now me. It has almost double the Hp the boat is rated for. It's a 1984 Sunray SS150. Other than just a funny name I wouldn't mind something that incorporated my 5 month son's name, Mason. How about "Mason Dixon Liner "
double the rated ? How about "Flipper"